(1) The cerebellum contains contains more neurons than all of the other brain structures put together and, almost entirely through the olives, forms cerebellar circuits with them. (2) The cerebellum consists of massively repeating groups of neurons called modules lying within these cerebellar circuits, the most prominent of which are vestibulocerebellar (VC), spinocerebellar (SC), and cerebrocerebellar (CC) circuits; CC circuits, which link the cerebellum with the neocortex, are particularly prominent. (3) The cerebellum is needed not only for high-level movements, but high-level cognitions as well. (4) The main processing role of CC circuits is memory timing - while neocortical memory networks retrieve memories as sequences to produce movements or cognitions, cerebellar timing networks time the sequences resulting in practiced, high-level movements and cognitions. (5) With practice, CC circuits employ supervised learning to adjust the strength of the timing signal and modify timing networks. The cerebellum seems to be larger and more complex than it needs to be at first glance. However, things make sense when its primary function is understood, a function that continues to be underrated yet is critical for optimal neocortical processing. The cerebellum or "little brain" is attached to the bottom of the brain. Unlike the neocortex which has broad irregular grooves and two hemispheres separated by a central fissure, the cerebellum has many finely spaced parallel grooves and no midline interruption (Heck and Sultan, 2002). The cerebellum is a pristine example of economy of space (Saab and Willis, 2003); it constitutes only 10% of the brain by weight, yet contains more than half of all the neurons (Ghez and Fahn, 1985). It is connected to the rest of the brain through three paired rope-like structures called peduncles - the superior peduncle joins the midbrain, the middle peduncle joins the pons, and the inferior peduncle joins the medulla (McCaffrey, 2008). The cerebellum receives information from the rest of the brain and spinal cord through the peduncles, processes it in the cerebellar cortex, and returns it via the cerebellar white matter, deep nuclei, and peduncles to the rest of the brain and spinal cord. The cerebellum receives information from mossy and climbing fibers. They have different origins and terminations. Mossy fibers branch extensively as they enter the cerebellar cortex and are named for the twisted, knotty appearance of their axonal branches; each mossy fiber synapses with 400-600 granule neurons (Walton and Lang, 2004). There are only 200 million mossy fibers in the human cerebellum, resulting in a massive output divergence as they synapse with 50 billion granule neurons (Walton and Lang, 2004). Most mossy fibers originate at the pons, although the neocortex is the ultimate input source; the remaining mossy fibers originate in the brainstem and spinal cord and do not transit through the pons. Mossy fibers terminate at granule neurons and send collaterals to the deep nuclei. They use the excitatory neurotransmitter glutamate (Swenson, 2006). Climbing fibers display a winding climbing pattern as they synapse with Purkinje neurons. Strikingly, each climbing fiber innervates exactly one Purkinje neuron, but it makes as many as 26,000 synapses as it climbs (Ito, 2001); the net input is so strong that a single action potential from a climbing fiber stimulates a long-lasting signal in a Purkinje neuron (Saab and Willis, 2003). Climbing fibers originate at the olives, which in turn receive inputs from the neocortex, spinal cord, and other structures. Climbing fibers terminate at Purkinje neurons and send collaterals to the deep nuclei. They use the excitatory neurotransmitter aspartate (Swenson, 2006). The cerebellar cortex, a tightly folded layer of gray matter folded up like an accordion, is the bulk of the cerebellum. It is less than one millimeter in thickness (Heck and Sultan, 2002) but if unfolded would give rise to a layer of tissue two meters long and several centimeters wide for a total surface area of 500 square centimeters (Heck and Sultan, 2003; Walton and Lang, 2004). The cerebellar cortex has three layers - at the bottom is the granular layer, densely packed with granule neurons and Golgi interneurons; in the middle is the Purkinje layer, a narrow layer of Purkinje neurons; and at the top is the molecular layer, containing dendritic trees, a huge array of parallel fibers, and interneurons (Walton and Lang, 2004). Viewed in three dimensions, the cerebellar cortex has a strict geometrical order, particularly in the molecular layer, with the flat dendritic trees in the sagittal plane and parallel fibers in the transverse plane (Heck and Sultan, 2002). Consequently, the inhibitory dendritic trees are oriented perpendicularly with excitatory parallel fibers (Eccles et al, 1967). There are three main types of neurons. Purkinje neurons are the final information decoders in the cerebellum (Saab and Willis, 2003) and are distinguished by the shape of their dendrites which form a profusely branching yet flattened "dendritic tree" (Walton and Lang, 2004). Purkinje neurons receive more synaptic inputs than any other cell in the brain; each receives approximately 200,000 weak excitatory parallel fiber inputs, one strong excitatory climbing fiber input, and many inhibitory stellate and basket interneuron inputs (Doya, 1999; Saab and Willis, 2003). Thus, excluding interneurons, each Purkinje neuron receive two dramatically different types of inputs - one consists of thousands of parallel fiber inputs, the other consists of a single climbing fiber input. The outputs of Purkinje neurons are channeled towards the deep cerebellar nuclei. Purkinje neurons use the inhibitory neurotransmitter gamma-amino butyric acid (GABA). Granule neurons are some of the smallest neurons in the brain but number around 50 billion in humans, thus comprising over half of all neurons in the brain (Walton and Lang, 2004). Granule neurons receive inputs from mossy fibers as well as a few Golgi interneurons. Each granule neuron axon projects to the upper layers of the cerebellar cortex and splits into two horizontal branches called parallel fibers, resulting in a distinctive T-shape; the parallel fibers runs for three millimeters from the split, making contacts with the dendritic trees of numerous Purkinje neurons (Walton and Lang, 2004). Massive convergence occurs as the 50 billion granule neurons send outputs to about 15 million Purkinje neurons (Walton and Lang, 2004). Granule neurons use the excitatory neurotransmitter glutamate. There are stellate, basket, and Golgi interneurons (Saab and Willis, 2003). They receive inputs from parallel fibers, but stellate and basket interneurons output to Purkinje neurons whereas Golgi interneurons output to granule neurons. The interneurons all use the inhibitory neurotransmitter GABA. Signals processed by the cerebellar cortex travel deeper within the cerebellar white matter to four deep gray matter nuclei. The cerebellar white matter, or arbor vitae (tree of life), is named for its branched tree or fern-like appearance (Saladin, 2012). Cerebellar white matter only contributes 25% of the cerebellar volume (Andersen et al, 1992) and consists of axons running to or from the cerebellar cortex with no intracortical feedback, so it is all feedforward (Heck and Sultan, 2002). In contrast, cerebral white matter contributes as much volume as the entire neocortex (Frahm et al, 1982) and 80% of it consists of intracortical connections, so it is largely geared for feedback. The deep nuclei are four clusters of gray matter buried in the cerebellar white matter. They receive inhibitory inputs from Purkinje neurons and excitatory collaterals from mossy and climbing fibers. With few exceptions, the deep nuclei are the sole output source of the cerebellum (Dietrichs et al, 1983). They use the excitatory neurotransmitter glutamate. Two striking cerebellar structural features should be noted. First, the cerebellum exhibits divergence followed by convergence; 200 million mossy fibers diverge onto 50 billion granule neurons, which then converge onto 15 million Purkinje neurons. Second, it has a feedforward structure, with virtually no feedback. The cerebellum is attached to the bottom of the brain. It constitutes 10% of the brain weight yet contains more than half of all the neurons in the brain (Ghez and Fahn, 1985). The cerebellum consists of both a cortex and white matter. If unfolded, the cerebellar cortex would be nearly two meters long and several centimeters wide for an enormous total surface area of 500 square centimeters (Heck and Sultan, 2003; Walton and Lang, 2004). The cerebellar white matter, or arbor vitae (tree of life), is named after its branched tree or fern-like appearance. Conceptual diagram emphasizing the basic structure of the main cerebellar fibers and neurons; interneurons are removed. Mossy fibers (blue) branch extensively and have a twisted knotty appearance. Climbing fibers (brown) display a winding climbing pattern as they work their way up the Purkinje neurons, making multiple synapses as they go. Purkinje neurons (green) display a branching yet flattened dendritic tree (viewed from the side, flat side not visible). Granule neurons (red) have axons that rise to the upper layers of the cerebellar cortex and then split into two horizontal parallel fibers, resulting in a distinctive T-shape. This is a drawing of two Purkinje neurons by Santiago Ramon y Cajal (Ramon y Cajal, 1899). Note the branching yet flattened dendritic tree (viewed head-on, flat side visible). Conceptual diagram emphasizing the connections between the cerebellar fibers and neurons. Mossy fibers (blue) send excitatory inputs to the granule neurons, as well as collateral inputs to the deep nuclei. Climbing fibers (brown) send excitatory inputs to the Purkinje neurons, as well as collateral inputs to the deep nuclei. Granule neurons (red) branch into parallel fibers which send multiple excitatory inputs to Purkinje neurons. Purkinje neurons (green) send inhibitory outputs to the deep nuclei. The interneurons (gray) regulate the others with inhibition. The deep nuclei receive excitatory inputs from the mossy and climbing fibers, and inhibitory inputs from the Purkinje neurons. This is a three-dimensional diagram of the cerebellar cortex, with input fibers, cerebellar cortex neurons, and deep nuclei shown; interneurons are removed. The main thing to note here is that dendritic trees are oriented in the sagittal plane whereas parallel fibers are oriented in the transverse plane. Consequently, the inhibitory dendritic trees are oriented perpendicularly with the excitatory parallel fibers. This conceptual diagram illustrates two striking structural features of the cerebellum. First, 200 million mossy fibers diverge onto 50 billion granule neurons, which then converge onto 15 million Purkinje neurons, which then converge onto less than one million deep nuclei cells; this is divergence followed by convergence. Second, signals are processed unidirectionally with no feedback within the cerebellar cortex; this is a feedforward structure. The functional circuits of the cerebellum are called modules, and each module is part of a circuit that links the three different cerebellar regions, called the vestibulocerebellum, spinocerebellum, and cerebrocerebellum, with many of the other brain structures, particularly the vestibular nuclei, the spinal cord, and most especially the thalamus and neocortex. Although we refer to the cerebellum as a single structure, it is actually organized into thousands of modules, each consisting of a set of long narrow strips of Purkinje neurons in the cerebellar cortex, their projections to a well-defined region of deep nuclei, and the climbing fiber input to both by a well-defined region of the olives (Ruigrok, 2011). The climbing fiber inputs from the olives to the deep nuclei are also matched by projections from the deep nuclei back to the olives (Ruigrok, 2011). Just like the basal nuclei (BN) circuits, modules are massively repeating preserved units, functionally segregated by their different connections with other brain structures (Apps and Garwicz, 2005). Yet also like BN circuits, this should not distract us from the fact that each module has the same structure and therefore a uniform processing algorithm probably exists throughout the cerebellum. Modules are components of circuits involving other brain structures - chiefly the vestibular nuclei, spinal cord, and thalamus and neocortex. Vestibulocerebellar (VC) circuits route through the vestibulocerebellum (the oldest cerebellar component) consisting of the small ovoid flocculonodular lobe and a few adjacent areas of vermis (a thin strip in the cerebellar midline) (Saab and Willis, 2003). VC circuits consist of bidirectional connections between the vestibulocerebellum and vestibular nuclei in the brainstem. In VC circuits, the vestibular nerve - terminating in mossy fibers - innervates the vestibulocerebellum directly; this is unique, as no other part of the cerebellum receives direct input from a sensory nerve (Swenson, 2006). Moreover, VC circuit Purkinje neurons synapse directly with the vestibular nuclei and are therefore the only cerebellar cortex neurons whose outputs do not pass through the deep nuclei (Swenson, 2006). Through their connections with the extrapyramidal vestibulospinal tracts and medial longitudinal fasciculus (MLF) (Gruart and Delgado-Garcia, 1994), VC circuits aid in the regulation of balance and eye movements (Murdoch, 2010). Spinocerebellar (SC) circuits route through the spinocerebellum (the next oldest cerebellar component), consisting of most of the vermis and the paravermal zones (Swenson, 2006). There are extensive ascending spinal cord inputs to SC circuits, including indirect (via the olives) and direct inputs terminating in the cerebellar cortex as climbing and mossy fibers, respectively (Saab and Willis, 2003). The deep nuclei outputs in SC circuits go to the red nucleus and its rubrospinal tracts, and the reticular formation and its reticulospinal tracts (Swenson, 2006); through these extrapyramidal tracts, SC circuits process proprioceptive inputs to regulate motor function at the spinal level (Murdoch, 2010) including posture and locomotion as discussed in chapter two. Cerebrocerebellar (CC) circuits route through the cereberocerebellum (the most recent and largest cerebellar component) and take up most of the large lateral hemispheres (Swenson, 2006). There is massive connectivity between the neocortex and cerebellum, with the cerebellum receiving more fibers from the neocortex than any other nervous system structure (Purves, 2001), although the circuits are polysynaptic, not monosynaptic like those between thalamus and neocortex (Buckner, 2013). The inputs to CC circuits originate largely in the parietal cortex (Saab and Willis, 2003). From this starting point, there are feedforward and feedback loops (Schmahmann, 1996). There are two feedforward loops, a pontine loop which passes from the parietal cortex to the pons and then connects via mossy fibers to the lateral cerebellar cortex, and an olivary loop which passes from the parietal cortex to the red nucleus and olives, the latter of which project climbing fibers to the lateral cerebellar cortex (Schmahmann, 1996). There is only one feedback loop; it passes from the deep nuclei to the thalamus and from there along thalamocortical circuits to various regions of the neocortex (Murdoch, 2010). CC circuit outputs are sent down the corticobulbar and corticospinal tracts; these circuits are strongly involved in the regulation of voluntary movements as well as cognitive, linguistic, emotional, and possibly even psychiatric functions (Murdoch, 2010; Rapoport et al, 2000); in fact, most of the cerebellum is dedicated to cognition (Buckner, 2013). The cerebellum is subdivided into the vestibulocerebellum (the oldest cerebellar component), spinocerebellum (next oldest), and cerebrocerebellum (newest and largest). The generic cerebellar module, consisting of a long strip of Purkinje neurons in the cerebellar cortex, their projections to a well-defined region of deep nuclei, and the climbing fiber input to both by a well-defined region of the olives (Ruigrok, 2011). These modules are functionally segregated into different circuits, but they all process data the same way. VC circuits have bidirectional connections between the vestibulocerebellum and the vestibular nuclei in the brainstem; the vestibular nerve innervates the vestibulocerebellum directly, and Purkinje neurons synapse directly with the vestibular nuclei. Outputs are sent to the vestibulospinal tracts (balance) and medial longitudinal fasciculus (eye movements). SC circuits contain extensive ascending spinal cord inputs. Outputs are sent to the rubrospinal and reticulospinal tracts (regulate reflexive motor behaviours such as posture and locomotion). CC circuits takes up most of the cerebellar cortex; the cerebellum receives more fibers from the neocortex than any other part of the nervous system (Purves, 2001). There are two feedforward loops, the first being from neocortex to pons to cerebellar cortex, the second being from neocortex to red nucleus to olives to cerebellar cortex. There is one feedback loop, from the deep nuclei to the thalamic ventrolateral relay nuclei and then on to various neocortical areas. While some outputs are sent down the corticobulbar and corticospinal tracts (regulation of voluntary movements), CC circuits are largely dedicated to cognition (Buckner, 2013). Since the 19th century, the cerebellum has been thought to be dedicated to motor function (Murdoch, 2010). The reason for this may have been that many earlier studies were based on animals (Murdoch, 2010) which are not always relevant to humans; the motor roles of the cerebellum overshadowed its substantial roles in cognition, language, and emotion (Murdoch, 2010; Schmahmann and Caplan, 2006). To appreciate what the cerebellum does, we first need to examine what happens when it is damaged. Anyone who has examined a person with cerebellar damage knows that it aids in the coordination of movements. Cerebellar damage is associated with distinctive movement difficulties - lesions of the vestibulocerebellum produce dysequilibrium (impaired balance) and nystagmus (involuntary eye movements); lesions of the spinocerebellum produce postural abnormalities and trunk or limb ataxia (impaired voluntary coordination); and lesions of the cerebrocerebellum produce limb ataxia, dysmetria (impaired ability to judge distances resulting in limb overshoot or undershoot), dysdiadochokinesia (impaired ability to perform rapid alternating movements), and dysarthria (impaired speech articulation) (Murdoch, 2010; Rapoport et al, 2000). Cerebellar damage does not impair the ability to produce movements - the neocortex does that - only the ability to execute them skillfully. 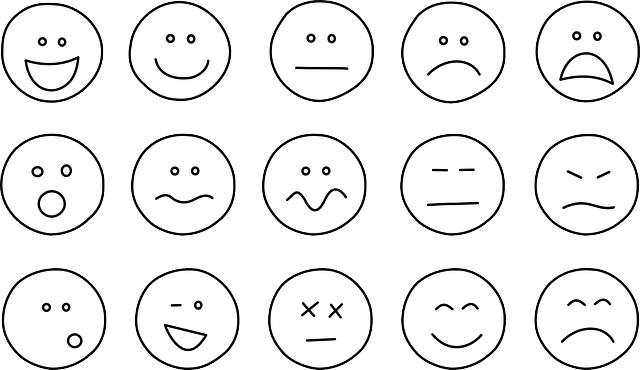 (2) Cognitive, linguistic, and emotional roles. Cognitive, linguistic, and emotional deficits are also produced by cerebellar damage, particularly damage that involves the lateral hemispheres of the cerebrocerebellum. These deficits are often missed for two reasons. First, the motor deficits often appear more impressive and may mask the non-motor problems (Murdoch, 2010). Second, cerebellar non-motor deficits involve high-level impairments in cognition and language and are therefore missed by standard cognitive and language tests (Murdoch, 2010). The cognitive, linguistic, and emotional deficits associated with cerebellar damage are called the cerebellar cognitive affective syndrome (Schmahmann and Sherman, 1998) which consists of impaired executive function (disrupted planning, cognitive flexibility, abstract reasoning, working memory, and verbal fluency), impaired spatial cognition (disrupted visual spatial organization and memory), impaired linguistic processing (disrupted syntax, semantics, and morphology, inability to speak in a grammatically correct fashion, and disruptions in prosody - variations in melody, intonation, pauses, stresses, intensity, vocal quality, and accents of speech), and impaired affective regulation (flattening of affect, disinhibition, and inappropriate behaviour) (Rapoport et al, 2000; Schmahmann and Caplan, 2006; Schmahmann and Sherman, 1998). Thus, just as the cerebellum controls the rate, force, rhythm, and accuracy of movement, so does it control the speed, capacity, consistency, and appropriateness of cognitive and linguistic processing (Murdoch, 2010), and to some extent emotion; some have even suggested that it may aid in the balancing, integrating, and stabilizing of brain functions relevant to psychiatry (Rapoport et al, 2000). Again, cerebellar damage does not impair the ability to produce cognition, language, or emotion, but rather the ability to perform or regulate them at a high level. (3) Uniting the roles of the cerebellum. Based on the above evidence, the cerebellum is involved in a wide variety of high-level functions including movements such as balance, eye movements, posture, voluntary trunk and limb coordination, judging distances, rapid alternating movements, and speech articulation, as well as cognitive processes such as executive function, spatial cognition, linguistics, and even affective regulation. While the common factor uniting these various motor and non-motor functions may not be immediately apparent, it relates to timing. One of many motor roles of the cerebellum is to coordinate rapidly alternating hand movements. Cerebellar damage can disrupt this coordination, resulting in dysdiadochokinesia. Another motor role of the cerebellum is to time how long to keep a finger moving towards a target. Cerebellar damage can disrupt this timing, resulting in dysmetria. A linguistic role of the cerebellum is to regulate prosody - timing the variations in melody, intonation, pauses, and stresses of speech. Cerebellar damage can disrupt prosody, resulting in major linguistic difficulties. Prosody is not relegated to language alone - the timing of variations in melody, intonation, and pauses is also critical in music. The cerebellum may even be involved in regulating affect and stabilizing brain functions relevant to psychiatry (Rapoport et al, 2000). We now speculate on the mechanism by which cerebellar circuits contribute to information processing in the brain. While the neocortex contains the memory networks that retrieve memories to produce movements and cognitions, the cerebellum appears to time these memories, especially practiced, high-level memories. Since the brain can only see, hear, or touch one small part of the world at any moment in time, sensory information flowing into the brain arrives as series of patterns arranged into sequences (the particular order in which things follow each other over time). Things in the world can be concrete, like a tree, or abstract, like a language, but the brain interprets both as sequences of patterns that occur over and over the same way (Hawkins, 2004) - in the case of vision, the brain interprets something as a sequence that is determined by the saccadic movements of one's eyes as they scan a visual scene over time, as discussed in chapter two; in the case of hearing, sounds occur as a stream of temporal patterns over time; in the case of touch, a thing is experienced as a sequence of touches as one's fingers explore and feel around it. Sequences are a core feature of neocortical processing. Each memory network retrieves a memory, which we defined as sequences of action potentials that represents the essential, invarying characteristics of a particular movement or cognition; the reason each memory is retrieved as a sequence of signals is that it was initially learned as a sequence of sensory signals. Consider the example of tying your shoelaces, which consists of a series of complex movements that you repeat in the same exact temporal sequence, every time. This was learned slowly, one step - one sequence - at a time. Different motor memory networks were created to reach out and grab the shoelace, and still others were created to make loops and tie knots; to tie more knots, when you need to tie your shoelaces, the neocortex retrieves these learned sequences from the relevant motor memory networks. Thus, the neocortical hierarchy both constructs and retrieves memories of the world in the form of sequences. (2) An internal timing system. Precise timing is essential for the neocortex to retrieve its memories, or sequences, so as to produce high-level movements and cognitions. To throw a ball skillfully, it must be released at precisely the correct time, an act that appears to be "preprogrammed" with no thinking involved in skillful throwers (Ivry et al, 2002). A cardinal feature of cerebellar damage is a breakdown in the temporal relationship between the forward movement of the arm and the ball release at the wrist (Ivry et al, 2002). People with cerebellar damage lose this timing, and so while they can still throw a ball, they do so badly, without skill. The cerebellum is also critical in timing cognitive and linguistic behaviours; patients with cerebellar lesions poorly judge the time interval between stimuli over short periods of time (seconds) yet show no deficits when judging other properties of the same stimuli, such as intensity (Ivry et al, 1989; Ivry et al, 2002). These examples and others suggest that the cerebellum acts as an internal timing system for neocortical memory networks - while the neocortex constructs the order of the sequence, the cerebellum determines the precise timing of the sequence. To put this yet another way, the neocortex determines what sequences of movements or cognitions to execute whereas the cerebellum determines when they should be executed (Ivry et al, 2002). However, a distinction must be made regarding the nature of that timing. In one good study, patients with cerebellar lesions performed three tasks - finger tapping, intermittent circle drawing (drawing a circle with a pause phase in which they remained in one position), and continuous circle drawing (drawing a circle with no pauses) (Spencer et al, 2003). The limb on the same side as the lesion displayed impairments in finger tapping and intermittent circle drawing, but no deficits in continuous circle drawing despite having to coordinate many different joints to complete the task. This suggests that the cerebellum is not involved in emergent timing (the amount of time required for movements or cognitions to actually be executed) but is critical in memory timing (the precise timing for the conversion of memory network sequences into movements or cognitions). (3) The memory timing mechanism. To examine how the structure of the cerebellum allows it to act as a memory timer, we will focus on CC circuits, which is reasonable since most of the cerebellum is devoted to these circuits. Earlier, we learned about modules, which consist of a long strip of Purkinje neurons in the cerebellar cortex, their projections to a well-defined region of deep nuclei, and the climbing fiber input to both by a well-defined region of the olives (Ruigrok, 2011). Just as groups of minicolumns in the neocortex form memory networks, we will speculate that so do groups of modules in the cerebellum form timing networks. There are dedicated timing networks for each memory network and they store temporal information regarding the real-time execution of their linked memory network. There is evidence that the olives generate an inherent, rhythmic signal (D'Angelo et al, 2011; DeZeeuw et al, 2008) that is relayed by olivary climbing fibers to both the deep nuclei and cerebellar cortex, a signal that acts as a timing signal for all cerebellar operations. High-level movements and cognitions are achieved through long periods of practice. Neuroimaging studies show that certain cerebellar areas activate when learned high-level behaviours are executed; for example, the right lateral cerebellum is activated during learned high-level linguistic demands (Petersen et al, 1989). Recall from chapter three that neocortical memory networks are matched against incoming sensory information. Upon being matched, their sequences must be relayed by CC circuits to the cerebellum to be timed - for example, in catching a ball, you first see the ball, then put your arm out, then open your hand, then adjust the position of your hand, one after the other; the neocortex knows the sequence, but it does not know the precise real-time execution of each movement that is best for that particular situation. Matched memory network signals are sent to the pons and relayed by pontine mossy fibers to the cerebellar cortex where another matching process occurs involving modules instead of minicolumns. The information diverges along granule neurons and their parallel fibers to find the Purkinje neurons of the best-matched timing networks, formed after long periods of practice, which then relay a converging modified memory network signal to the deep nuclei where it is integrated with the olivary timing signal. This feedforward processing is fast; the cerebellum processes information in milliseconds, whereas the relatively ponderous feedback-laden neocortex requires hundreds of milliseconds to perform its computations (D'Angelo et al, 2011). Upon reaching the deep nuclei, the modified and baseline timing signals are integrated to create a modified timing signal that is sent on to the thalamus and neocortex; this is the signal that times the neocortical sequences resulting in precisely timed, high-level movements and cognitions. Some movements and cognitions have not been practiced. When the neocortex executes a sequence of unpracticed movements or cognitions, such as throwing a ball with your non-dominant hand, no corresponding timing networks exist. Matched memory network signals are sent to the pons and relayed by pontine mossy fibers to the cerebellar cortex, but the cerebellar matching process results in nothing but poor matches. In this case, the modified memory network signal returned to the deep nuclei is weak, and the olivary timing signal is not modified. This unmodified timing signal is returned to the thalamus and neocortex. It will still time neocortical sequences resulting in movements and cognitions, but since the timing signal is inherently generated and not modified by previous experiences, the movements and cognitions will be poorly timed. When trying to catch a ball, a sequence of discrete movements is produced by your neocortex; the cerebellum times the sequence of movements. First, you see the ball. Second, you put your arm out. Third, you open your hand. Fourth, you adjust the position of your hand to place it in the best spot. If you are practiced in catching a ball, the sequence of movements will be timed properly and you will catch it. If you are unpracticed or your cerebellum is damaged, the sequence of movements will be mistimed and you will miss it completely (fortunately it passed by without hitting you in the head). Finger tapping consists of a sequence of discrete taps over time. This is impaired in patients with cerebellar damage (Spencer et al, 2003). In intermittent circle drawing, a pause is introduced at the top of the circle drawing task. Intermittent circle drawing is also impaired in patients with cerebellar damage. In continuous circle drawing, there are no pauses. Continuous circle drawing is not impaired in patients with cerebellar damage. Recall that a module consists of a long strip of Purkinje neurons in the cerebellar cortex, their projections to a well-defined region of deep nuclei, and the climbing fiber input to both these zones by a well-defined region of the olives (Ruigrok, 2011). Groups of modules form timing networks, each of which is linked to a particular memory network in the neocortex. Timing networks store temporal information regarding the real-time execution of their linked memory networks. Here is a diagram of practiced, high-level timing in CC circuits. Matched memory network signals are sent to the cerebellar cortex along pontine mossy fibers, timing network matching occurs, and a modified memory network signal is produced and sent to the deep nuclei where it is integrated with the timing signal being relayed along olivary climbing fibers; the result is a modified timing signal that tells the neocortex the precise timing for the sequence of movements or cognitions that it wants to produce, resulting in a good outcome. Here is a diagram of unpracticed timing in CC circuits. There are no good matches among the timing networks and so the olivary timing signal remains unmodified that tells the neocortex how to time its sequences, with a dubious outcome. Information from this outcome is relayed to the olives and forwarded along climbing fibers to the cerebellar cortex as a teaching signal, which stimulates the formation of timing networks relevant to the situation at hand so that a better outcome is achieved in the future. Learning methods may be classified as reinforcement (reward-based trial and error), supervised (error-based teacher), or unsupervised (internal rules). It is time to discuss supervised learning. Supervised learning involves an error-based teacher. Correct actions are noted, but if an incorrect action is performed then the teacher sends an error signal to demonstrate the correct answer. 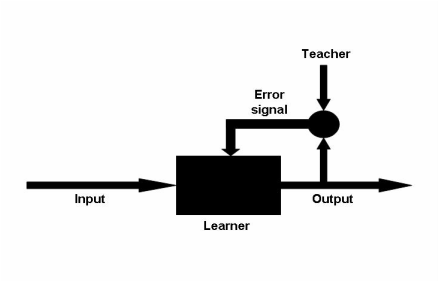 There is an input (instructions), a learner, an output (the behaviour executed by the learner), and a teacher (sends the error signal used to teach the learner). In reinforcement learning, incorrect actions are not rewarded, nor is the correct answer demonstrated. Regardless of whether a sequence of movements or cognitions is timed well or not, an outcome results. Sensory information relaying the outcome in the world is relayed to the olives, which forward the information along climbing fibers to the cerebellar cortex. The climbing fiber signal to the Purkinje neurons is strong and there is evidence that it acts not only as a timing signal to the deep nuclei but also as a teaching signal by relaying the success of outcomes to the cerebellar cortex (Albus, 1971; Marr, 1969). By comparing intended or predicted movements and cognitions with their actual outcomes, the cerebellum modifies its inventory of timing networks to produce better outcomes in future. (3) The teaching signal hypothesis. The idea that the cerebellum is a supervised learning system was conceived decades ago (Albus, 1971; Marr, 1969). Matched memory network signals (the input) are relayed along mossy fibers to the timing networks (the learner) which send a modified memory network signal to execute the memory timing (the output) for the movements and cognitions retrieved by the neocortex. 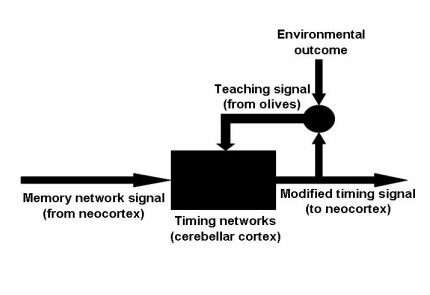 The outcome is sent as sensory feedback to the olives (the teacher) which send strong timing signals along climbing fibers to the deep nuclei which are integrated with the modified memory network signal, as well as teaching signals along climbing fibers to the cerebellar cortex relaying how the timing should have been; if this persists long enough through practice, synaptic modification occurs. The cerebellum is highly plastic, and long-term potentiation and depression at Purkinje neuron synapses form the basis of error-driven learning (Doya, 2000). Supervised learning is learning with the help of an error-based teacher. Correct actions are noted. Incorrect actions are associated with an error signal sent by the teacher and a demonstration of what the correct answer should have been. Generic supervised learning system. There is an input (instructions), a learner, an output (the behaviour executed by the learner), and a teacher (sends the error signal used to teach the learner). Supervised learning as applied to the cerebellum. Matched memory network signals (the input) are relayed to the relevant matched timing networks (the learner), which convert the signal into a modified timing signal (the output) for the behaviour desired by the neocortex. The environmental outcome of the behaviour is sent to the olives (the teacher) and then relayed as a teaching signal (the error signal) to the cerebellar cortex. The cerebellum times memories; the neocortex determines what memories to execute; the cerebellum determines precisely when they should be executed. If less emphasis is placed on the performance of movements and cognitions at a high level, it seems less important than the other brain structures. However, this view is erroneous; timing is everything. Time to have a go at the hippocampus. Albus. 1971. The theory of cerebellar function. Mathematical Biosciences 10, 25-61. Andersen et al. 1992. A quantitative study of the human cerebellum with unbiased stereological techniques. Journal of Comparative Neurology 326, 549-560. Apps and Garwicz. 2005. Anatomical and physiological foundations of cerebellar information processing. Nature Reviews Neuroscience 6(4), 297-311. Armano et al. 2000. Long-term potentiation of intrinsic excitability at the mossy fiber-granule cell synapse of rat cerebellum. Journal of Neuroscience 20, 5208-5216. Buckner. 2013. The cerebellum and cognitive function: 25 years of insight from anatomy and neuroimaging. Neuron 80(3), 807-815. D'Angelo et al. 2011. The cerebellar network: from structure to function and dynamics. Brain Research Reviews 66, 5-15. De Zeeuw et al. 2008. Causes and consequences of oscialltions in the cerebellar cortex. Neuron 58, 655-658. Dietrichs et al. 1983. Do pontocerebellar fibers send collaterals to the cerebellar nuclei? Brain Research 259, 127-131. Doya. 1999. What are the computations of the cerebellum, the basal ganglia and the cerebral cortex? Neural Networks 12, 961-974. Doya. 2000. Complementary roles of basal ganglia and cerebellum in learning and motor control. Current Opinions in Neurobiology 10, 732-739. Eccles et al. 1967. The cerebellum as a neuronal machine. Springer-Verlag. Frahm et al. 1982. Comparison of brain structure volumes in insectivora and primates. Journal fur Hirnforschung 23, 375-389. Ghez and Fahn. 1985. The cerebellum. Principles of Neural Science, 2nd edition. Elsevier. Gruart and Delgado-Garcia. 1994. Signalling properties of identified deep cerebellar nuclear neurons related to eye and head movements in the alert cat. Journal of Physiology 478, 37-54. Heck and Sultan. 2002. Cerebellar structure and function: making sense of parallel fibers. Human Movement Science 21, 411-421. Herculano-Houzel. 2010. Coordinated scaling of cortical and cerebellar numbers of neurons. Frontiers in Neuroanatomy 4(12). Ito. 2001. Cerebellar long-term depression: characterization, signal transduction, and functional roles. Physiological Reviews 81(3), 1143-1195. Ivry et al. 1989. Timing functions of the cerebellum. Journal of Cognitive Neuroscience 1, 136-152. Ivry et al. 2002. The cerebellum and event timing. Annals of the New York Academy of Sciences 978, 302-317. Marr. 1969. A theory of cerebellar cortex. Journal of Physiology 202, 437-470. McCaffrey. 2008. The cerebellum. http://www.csuchico.edu/~pmccaffrey/syllabi/CMSD%20320/362unit7.html. Murdoch. 2010. The cerebellum and language: historical perspective and review. Cortex 46, 858-868. Petersen et al. 1989. Positron emission tomographic studies of the processing of single words. Journal of Cognitive Neuroscience 1, 153-170. Purves. 2001. Neuroscience, 2nd Edition. Sinauer Associates. Ramon y Cajal. 1899. Comparative study of the sensory areas of the human cortex. Ruigrok. 2011. Ins and outs of cerebellar modules. Cerebellum 10(3), 464-474. Saab and Willis. 2003. The cerebellum: organization, functions, and its role in nociception. Brain Research Reviews 42, 85-95. Saladin. 2012. Anatomy and physiology: the unity of form and function. McGraw Hill. Schmahmann. 1996. An emerging concept: the cerebellar contribution to higher function. Archives of Neurology 48, 1178-1187. Schmahmann and Caplan. 2006. Cognition, emotion and the cerebellum. Brain 129, 299-292. Schmahmann and Sherman. 1998. The cerebellar cognitive affective syndrome. Brain 121, 561-579. Spencer et al. 2003. Disrupted timing of discontinuous but not continuous movements by cerebellar lesions. Science 300(5624), 1437-1439. Swenson. 2006. Cerebellar systems. http://www.dartmouth.edu/~rswenson/NeuroSci/chapter_8B.html. Walton and Lang. 2004. Cerebellum. The Synaptic Organization of the Brain. Oxford University Press.